Have you ever learned a "truth" from reading a historical novel and if so what was it? Answers by September 7th, please. Please write your entries in the Comments below. All our competitions are limited to UK residents. You know him for his Lives of the Artists, but there was no word meaning just "artist" in sixteenth century Italy. The original title was: Le Vite de' più eccellenti pittori, scultori, ed architettori (1550) and it was arguably the first Art History book along with the biographies it contained. So far, so good. Or maybe not. 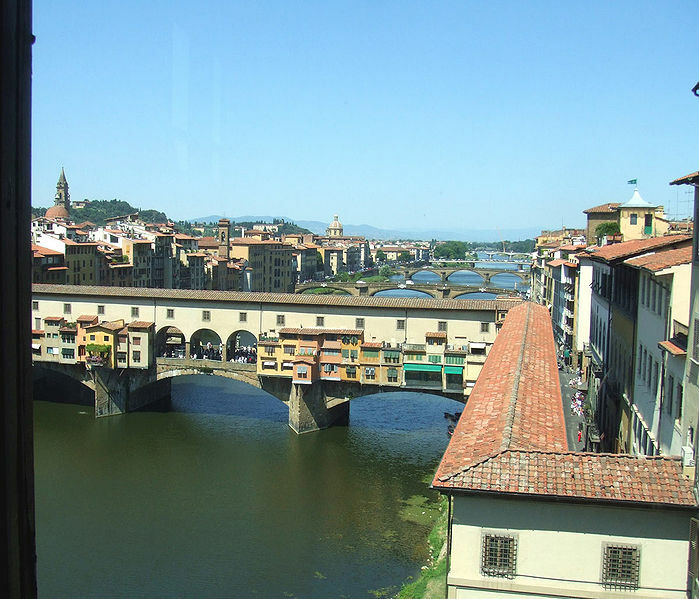 Fellow History Girl Michelle Lovric, in whose beautiful Thameside apartment I am writing this post, wants me to say that Vasari was a scurrilous rumour-monger, whose "Lives" has been far too influential. Vasari idolised Michelangelo, whose long life encompassed his own. Also good. 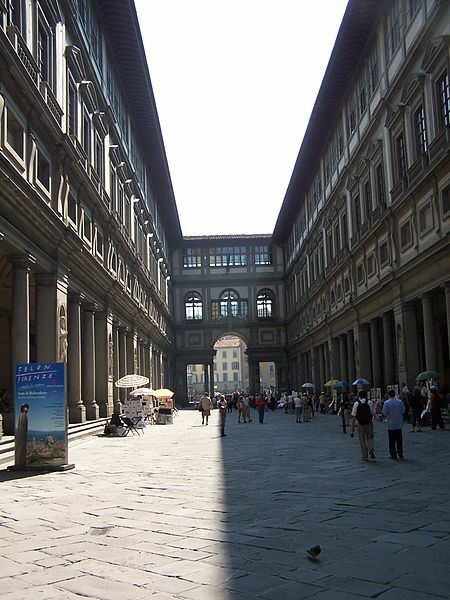 And his achievements as an architect are superb: The Piazza degli Uffizi in Florence is a marvel of "bringing the inside outside" as achieved first by his great role-model in the Laurentian library in that same city. 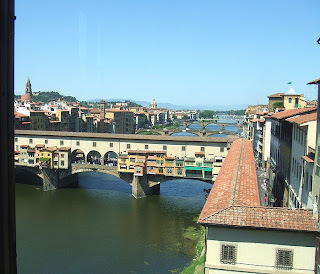 I've never managed to get into it but here it angles its seductive way across the Ponte Vecchio towards Santa Felicita, from where the de Medici could "attend" Mass without being seen. 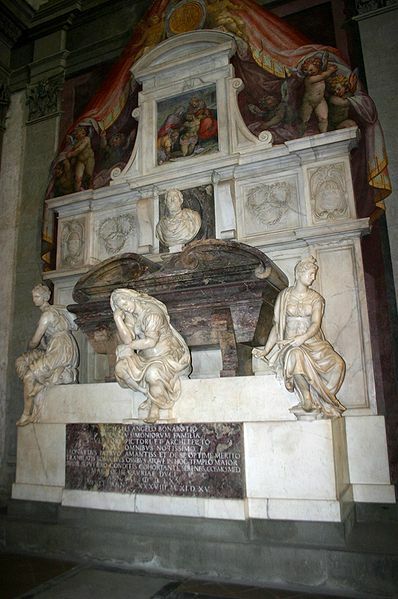 The tomb Vasari designed for his hero, Michelangelo, in Santa Croce. It's an abomination, isn't it? I love the façade of Santa Croce and sitting in the Piazza outside drinking coffee but I won't go inside it any more, even though Michelangelo is my hero too. 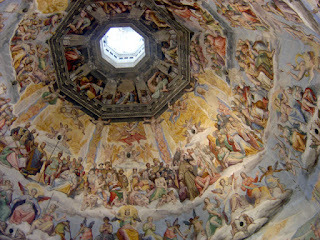 Because Vasari covered up Giotto frescoes on the wall of the Nave with lots of little altars! How could the same man have two such conflicting sets of aesthetics? It is beyond me. 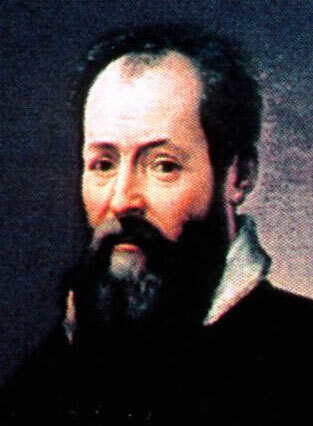 As is Giorgio Vasari. 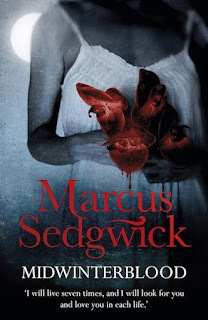 Another real treat as our August guest: Marcus Sedgwick. Marcus Sedgwick was born and raised in East Kent in the South-east of England. He now divides his time between a small village near Cambridge and the mountains of Switzerland. 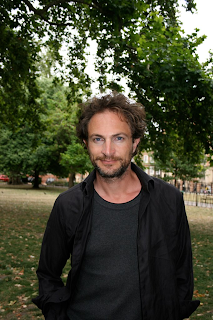 Alongside a 16 year career in publishing he established himself as a widely-admired writer of YA fiction; he is the winner of many prizes, most notably the Branford-Boase Award for a debut novel (Floodland), and the Booktrust Teenage Prize (My Swordhand is Singing). His books have been shortlisted for over thirty other awards, including the Carnegie Medal (four times), the Edgar Allan Poe Award (twice) and the Guardian Children’s Fiction Prize (four times). Of all the books I've had published, I would say maybe two or three of them are what I would classify as historical fiction: Revolver, set in the Arctic in 1910; The Foreshadowing, set in the run up to the Battle of the Somme, and Blood Red, Snow White, the true story of Arthur Ransome's experiences as a spy during the Russian Revolution. Then I have a few books that are probably better placed towards the Fantasy shelves, but which contain aspects derived from various historical delvings, I'm thinking here of books like The Book of Dead Days or the Dark Horse, the latter inspired by The Sagas of the Icelanders. As for my most recent book, Midwinterblood, I have no idea how it should be classified, being seven stories in one book, which link to form a larger eighth story, about love and sacrifice. The seven stories are set in seven different times, from the future to the place in the past where myth and history are inseparable. Unlike some of my earlier books, it did not require large amounts of research. With the three first named books above, I spent months on reading and travelling and delving into libraries: the stack of books I read to write The Foreshadowing was taller than I am; for Revolver I travelled in the Arctic and learned how to fire a live revolver, for Blood Red I spent longer than I can remember in various archives putting together Ransome's life story. I didn't do this because I felt I had to, or because I think I was doing my homework properly that way or because I wanted to be able to show off about it afterwards, but because it was fun. I love research, and the great thing about being a writer (as opposed to my friends who are academics) is this: you only have to do as much research as you need and/or want. You can stop when you have enough, you don't have to read everything on the subject ever written, you don't have to back anything up with references and footnotes, and best of all, if you don't like the facts you've uncovered, you can change them to something you like better. So you get all the fun of being a historian without the dreary bits. You might ask if that holds true for a book like Blood Red, Snow White, which, being based on a true story, someone's life story, needs to stick to the facts. Well, my answer to that is "sort of" but I'll come back to that in a bit. So why didn't I do so much research for Midwinterblood, if I love it so much? Well, partly because the times I chose to write about in the book were areas I feel fairly comfortable with already. 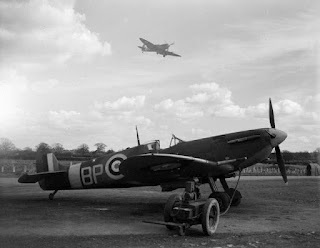 Partially it was because being short stories, each of them required fewer bits of historical fact, for example, I did a spot of research into Spitfires and their bases of operation in the war because it came up as I was writing that section of the book. But finally, and I think more importantly, I think it's because my attitude to historical fiction has changed over the years. I'll be completely honest and say I'm still not sure what I intend to do when I write, and I'm still not sure about my relationship to historical fiction, but I feel that at the moment, I see historical fiction slightly differently from how I once did. I used to think that you needed to immerse yourself in the subject in order to be as true to that period as you could be, and that if you were true to that period, you would write a good historical book. But I'm not so sure anymore. Now I think all that's important is that you are true to what it is to be human. It's a truism (I think) to say that that's what storytelling is about: saying something real about living. I'm not for one second saying that I think historical writers who go for total accuracy are wasting their time, far from it. I'm saying that I think I have drifted away from this belief to a position where I see the study of history as something to get me excited about or interested in an event, or moment, or action that I can use in a book, because it says something true about living. I think that all writing is a fiction, even the most accurate historical fiction (there's a clue in its name). 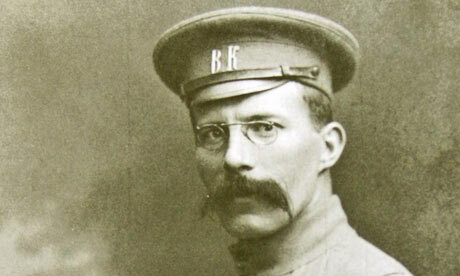 Even a true life story is fiction: how could I ever pretend to know what was in Arthur Ransome's head minute by minute, day by day? I can't, of course. But I was touched by his life and felt it made a good fictional story, so I decided to tell it. Ransome, like many, many authors, fictionalised certain parts of his own autobiography, something which I found liberated me from the fear of not "being true" to his life 100% accurately. People often have criticised authors when they do this, and now I'm thinking of Ernest Hemingway, because whatever else you think about him, he was at least very honest and explicit about this process: the merging of fact and fiction. 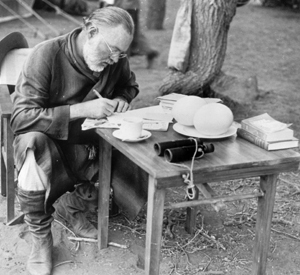 Truth, for Hemingway, was something a little different from how the word usually gets used. Truth for him was to say something accurate and real about what it is to be human, and if that meant using a "lie", then so be it. And that's the way I see historical fiction now, because it's the way I see all fiction: we use lies to tell the truth. After GB’s Olympic triumph, I was going to write about dressage this month, a sport which commentators insist is mysterious and faintly peculiar. Horses doing ballet! Riders doing not much! Well, there you go! Dressage is neither mysterious nor peculiar. It evolved through pretty straightforward considerations of life and death: your warhorse needed to be smart, obedient and pretty damned nifty to get you out of harm’s way. You needed to teach it to move sideways, backwards, upwards, the full spin, the half spin, and all this instantly and without hesitation. You get the picture. Since you can't teach tanks dressage, after horses fell by the wayside as far as war was concerned, these elegant lifesaving manoeuvres became a competitive equine discipline. Anyhow, my mind teaming with dressage moves and smart things to say, I then discovered something truly horrible. In the huge clearout last year, when we moved the kitchen in a domestic earthquake worthy of Thomas and Jane Carlyle, I seem to have mislaid (please please not discarded) all my dressage books. Indeed, I can find none of my horse books at all; no blue Pony Club Manual 1966, no Keeping Your Pony at Grass (whose cover was disconcertingly yellow – why not green? ), no What the Farrier Does given to me, I think, by Father Christmas. Nothing for it, I'm reduced to cows - the animal kind, not human. In a fit of mental abstraction (I wasn’t even pregnant) I once bought a book about cows – The Complete Cow, by Sara Rath. It’s a great book, a mine of historical and not so historical cow information. Did you know, for example, that ‘soldier’ in Sanskrit, means ‘one who fights about cows’? To my surprise, I’ve consulted this book quite often. Once you realise how important cows have been in the whole of man’s history, it begins to feel rude to gloss over them in a historical novel. Rude and historically negligent. The cow is not just an animal. As William Dempster Hoard reminds us, ‘the cow is the foster mother of the human race. Form the day of the ancient Hindoo (sic) to this time have the thoughts of men turned to this kindly and beneficent creature as one of the chief forces of human life’ (Rath: 17). We have mythical cows like the Minotaur (I’m counting bulls as well); we have holy cows in India; we have beribboned cows in Liechtenstein (the ribbon goes to the winner of the summer cow beauty pageant) and we have human cows courtesy of the ancient Roman wedding where the woman says ‘You are the Bull, I am the Cow’. Every family in every historical novel depends on the cow: cows are always a feature. But is a cow ever The Feature, even in a modern novel? I don’t think so. Cows are comic, as in Doreen Cronin’s Click Clack Moo (2000) or David Milgrim’s Cows Can’t Fly, or even subversive as in Munro Leaf’s 1936 story of Ferdinand the pacifist bull. But they’re never heroic. I think there’s a historica gap to be filled. My family had a cow, disconcertingly called Butterfly. Here’s a link to her picture. She was a prize cow, but no beauty, at least she doesn't seem a great beauty to me even bearing in mind that in 19th century portraits, cows always look like oxo cubes. Nevertheless, I think of her sometimes, and of all those family cows that, for centuries and centuries, stood between a child’s life and death: a bit like dressage after all, so it turns out. Rath, S. (1998) The Complete Cow, MN, USA, Voyageur Press, Town Square Books. Ostensibly well brought up, in navy blue jerseys with white lace collars, a neat ribbon at the neck and always a hat, they were in fact a bunch of little monkeys — Elma, Zoe and Irene excluded. The eldest brother Douglas is remembered with his feet up on the nursery mantelpiece, eating sweets; Presh christened their black straw Sunday hats the Flyaway Hats and would do her best to ensure that hers did; even Wilfrid, the kind and gentle one, had such a terrible fight with a nursemaid over the washing of his neck that blood was drawn. Rosslyn was first expelled from school at six for lifting the lady teachers' skirts: 'I only wanted to see if they had legs,' he explained. Later he made a habit of getting expelled, largely because he insisted on keeping his animals with him at all times. This habit stayed with him all his life: as a full-grown clergyman he would preach with a lemur peeping out of his pocket, produce a grass-snake in Sunday School to illustrate the story of Adam and Eve (prompting one small pupil to tell his mother that Rev. Bruce kept the devil in his pocket) and unloose a white dove during a sermon on the Holy Spirit. His middle name was Francis, and his nickname d'Assisi. The young Bruces delighted in tormenting their great-uncle and their governesses. One, a Miss Sandeman, arrived the same day as Rosslyn's new incubator. (Rosslyn bred mice; in later life his ambition was to breed green ones. It took him fifty generations, he claimed, and was reported in the Daily Sketch. He also bred a terrier for Queen Victoria, when he was six.) The children decided to interchange their names, and the height of their success was when their great-uncle came into the schoolroom and said 'Good morning, Miss Incubator.' They used to hide from her and tease her: 'She, poor soul, suffered much, and was powerless,' admitted Podge. Another was a Presbyterian but agreed to take them to their (Episcopalian) church: 'We knew she would know nothing of the service so we made up our minds to astonish her with every form of ritual we could imagine, finally arranging that at the second last prayer (St. Chrysostom) we should kneel with our backs to the altar . . .' Kathleen had a black velvet dress (they spent a lot of time in mourning, for their mother, their father, their grandfather, their uncle the Archbishop of York) which was very stiff and would stand up on its own; Podge would sit it up on the bed with shoes and stockings dangling and invite Bertha the maid to come and have hysterics at the sight of Kathleen's headless body. The highest mark they could get for schoolwork was 3; if they got enough 3s they would have a treat. Feeling that the 3s were not coming fast enough, Podge and Kathleen stole their mark books and took them to the Botanical Gardens with a pencil and an India rubber, where Podge practiced and practiced to form a 3 like Miss Incubator's, and then awarded 3s wherever the children felt they were deserved. The ruse was not discovered, and Podge claimed that she wrote her 3s like Miss Incubator's till the end of her days. When they started school Podge used to play truant regularly; she would lurk in the 'Botans' and when spotted (one of her brothers told on her) she claimed she had gone in there to do up her petticoat. In the end she and Kathleen both were hauled up before the curator of the Botans for consistently breaking rules—they had a running feud with the head gardener there, Foxy—but managed to get off because Great-Uncle William was a friend of the curator. They used to fiddle the accounts for their schoolbook buying in order to have more money for sweets, and at one school at least children were warned against 'those awful Bruce girls'. In a religious Victorian family all this naughtiness was rather mere serious than it might be considered today, but there really was nobody to keep track of all of them. 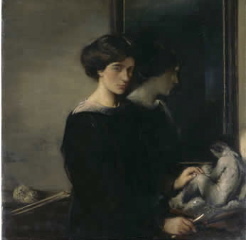 Elma, who had become what Kathleen described as 'rather unwholesomely religious', perhaps on account of her responsibilities, certainly tried, but she could not always succeed. She took her small siblings on religious retreats, which simply made them naughtier. She would listen to them read their collects every Sunday, and ask them questions. 'Who was David?' she asked Kathleen. 'A ma..a..a..n,' replied Kathleen, irritatingly if accurately. 'Well, did you think I thought he was a pig?' Elma snapped. She also tried to make Kathleen eat mutton fat; Kathleen just developed a technique of hiding it in her pocket. 'Kathleen has got quite sensible about her food now,' Elma would say. 'These things, of course, only need a strong hand.' Kathleen, meanwhile, was slyly dropping little packets of mutton fat in the gutters of the streets of Edinburgh. Great-Uncle William had poor sight: he didn't notice when they used a red-hot poker to brand numbers on the backs of a set of polished mahogany chairs (the chairs were being pupils in the children's school, and they needed to be able to tell them apart, so they knew which one had taken its turn at reading, and which one was due to spell). There was an ancient chest, a family heirloom through the Skenes, which had belonged to Bonnie Prince Charlie; the little girls labeled each drawer of it with the names of their dolls, and on one occasion cut a piece of cloth off the old kilt that lived in the secret drawer to make a plaid for their doll Gerald. The kilt too had belonged to Prince Charlie, he'd worn it on his escape to the Isles, and so it was said. Uncle William never noticed any of these things. He didn't even always notice whether or not the plates were in place when he dished out the stewed prunes, much to the children's delight. He was not a fool about the children, though. When they waylaid the serving staff, hijacked their uniforms and served up dinner to the grown ups Uncle William would never quite let on whether or not he had noticed. On one occasion while Elma was away Podge devised a way of missing church. Uncle William asked her if she would like to be punished now or wait for Elma to return; Podge was scared enough to prefer to wait for Elma. In fact Uncle William was not strict. There was a tawse in the house, but it was more often used on him in play than it was on the children. Podge had merely been infected with something of Kathleen's fear of men. Although later in life Kathleen would say that she had only ever been interested in male creatures, this was not true. She recalled herself having had girl dolls, but having 'put all kindly but firmly to bed with measles. So, through life, let all females be kindly and comfortably disposed of, so that my complete preoccupation with the male of the moment be unhampered!' Her boy doll (Gerald—he of the plaid), 'a sailor boy with blue eyes and brown curls', went 'everywhere with me', and was 'my idol, my baby, my love', so Kathleen recalled. Podge, on the other hand, clearly recalls a small Kathleen trailing her beloved girl doll Rosie around. Certainly Kathleen, however she may have seen herself, was not one to dispose of women. Far from it: she spent a great deal of her adult time delivering babies, caring for their mothers and looking after her female friends in trouble. At this stage she did not like men at all. In Edinburgh at that time it was very difficult to avoid drunks, and perhaps Kathleen imagined that all men were likely to behave in a frightening and drunken fashion. When she was seven and their uncle took them all aside to tell them that he had bad news for them, she and Podge both assumed that he was going to tell them he was going to prison. Kathleen quite expected that any man might have to go to prison at any time, being as they were the embodiment of evil. In fact the bad news on that occasion was the death of their father. The Canon had tried hard to put things in order for his children before he died, but, as he wrote to William three months before his death, knowing that he had not long to go: 'I have no notion what my young ones are to do by and by, unless the Mrs. (who is in Sheffield and very poorly) takes them under her protection more or less. . . Before she went abroad she very positively declared she would have nothing to say to any of them. 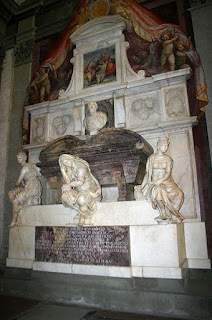 . .' He was buried beside Janie at Carlton, and Rosslyn had a ferret in his pocket for the funeral. Mrs. Parker continued to have nothing to say to them, but she made good some years later when she paid for Roslyn to go to Oxford (where, legend claims, he kept a baby elephant, because the rule of Worcester College was 'no dogs'). When Kathleen was about twelve another frightening man appeared in her life, her cousin Willie. He stayed at Inverleith Row for about a year, and he was old enough to have a latchkey, and wicked enough to stay out at night after the front door had been double-locked. Kathleen's bedroom was on the ground floor overlooking the garden, and Willie would tap at her window in the small hours, demanding entrance. She would have to creep in silence across the dark dining room and the cold marble-floored hall, and silently unlock the door for him. 'The rage of the young man was terrifying if the bolt, bar or chain made the slightest sound. More strange and terrifying was he when in the dark and silence he would be ingratiating and affectionate.' Kathleen feared, hated and adored him in equal proportions. He would do an alarming impersonation of a hunchback and tell her it was useful in avoiding the police. 'Neither then nor when I grew up did I have the faintest notion why he wanted to avoid the police. . . I thought it meant that he was some unthinkable evildoer.' What form his ingratiating affection in the dark hallway took is unknown, but whether out of fear or loyalty she never betrayed him. Hello Prechie Here I blooming well are—beastly drunk and dead broke—so [sic] my pal. We've been here four days. We came with a thousand and forty pounds between us. He brought £1025 and I £15. I won £55 the first night lost £80 the second and now am dead drunk [crossed out) broak. So's my pal. Don't tell your brothers where 1 am my people don't know. I've not paid a bloody soul for my hotel bill. It's come to 30 frcs a day. Writing to a pal to send me thirty, Don't suppose he'll. Applying for a situation as a waiter at the hotel here. Lovely women here Russian princesses by the score. One very smart one to whom I was sufficiently attentive when I first came down lent me forty Louis—plunged on rouge and lost then she wanted to save me hotel expenses by—well you know—sort of marrying me but I heard she was already married and well it wasn't my fault and I was drunk at the time the wine's so beastly cheap and good here and we get it for nothing as we don't pai. Like a sweet Prechie write me a long cheering wholesome letter to do me good and I promise not to be drunk when I write again . . . ever . . . Willie. From this age onwards you had no one to mother you or shew you any affection of any kind and more and more you shut yourself up and became reserved and chary of shewing any feeling whatsoever, partly due to our somewhat Spartan bringing up but more I think from fear of being laughed at. Once however you began to cry and nothing and nobody could stop you, you sobbed and sobbed, no one knew why and no one could console you, you lay on the bed inconsolable. At last Elma came in and Hilda told her. I shall never forget seeing the determination in her quick walk as she went to your room and came down like a thunderbolt. 'Get up AT ONCE , wash your face and stop this minute.' Implicit obedience and not another sound! As a young child Kathleen was bereft, seeking affection and attention, and getting not much. If anyone complained of a headache, Kathleen would have one too. Mother figures came and went; the continuous one, Elma, was clearly unsatisfactory. As she grew older, she learnt her worth and her independence. The imagination, which Podge once called ‘ridiculous’, became a source of fine games for both of them. She had an outwardly rebellious period, when she would go off to the sea without permission (and in the middle of the night, if she could); but she soon learnt the subtle art of doing exactly what you want without anyone noticing. She quietly avoided being confirmed for some years—she did the preparatory lessons, but avoided the ceremony. Her form mistress at St George’s School in Edinburgh reported her as having original ideas, but tending to keep them to herself. A contemporary, a Miss Baily, remembered her as: 'a sturdy, indomitable little figure . . . bright blue eyes, a mane of thick brown hair and a clear-cut classical profile and . . . a certain attractive exuberance of temperament. Sharing a desk with her in the Upper IIIrd Remove of 1891-2 was anything but dull. Merriment reigned in her neighbourhood.' At some point when she was quite young, Kathleen decided to be happy, no matter what. Found them pretty gloomy . . . the gas was not turned on at the main so they borrowed a lamp from the Theological Hall, but like the Biblical virgins' it hadn't got no oil so 'they sat in solemn silence in a dull dark etc. ', cussing inwardly at each other. It was too dark for either of them to reach the poker otherwise there might have been 'another 'orrible murder'. They're a rum couple . . .
After a year of this Kathleen went to boarding school. It is hard not to surmise that she was 'packed off'. Podge had already been (in her own words) 'sent away'. Kathleen's first boarding school was 'a cheap convent', as she called it, where she had to bathe in a chemise: 'I was carefully initiated into the tricky art of changing from a wet chemise into a dry nightgown without one dangerous moment of seeing my own person.' There was chapel three times a day and five times on Sunday, and the girls were given to having visions due to religious over-excitement. A popular one was for Christ the man to come down from the cross; for Kathleen, Christ the baby clambered from his mother's arms and lay in hers. She loved it, and was late for dinner. She and Podge had had baby friends in the Botans and at Pettycar, where they went on holiday. 'Babies were our chief amusement and interest,' wrote Podge, who went on to be one of the first Norland Nannies, and to run a children's home. There was Mary Ann Frew, for example, aged eight months, whom they shared between them in hourly shifts, and a two-year-old named Arthur to whom Kathleen had given a toy horse. He had a very grand nanny, and the next day the horse was sent back because Arthur was not allowed to accept presents from people his mother did not know. Religion was important to the Bruces—three of the four brothers took the cloth (Wilfrid alone didn't, he became a sailor); two of the sisters married churchmen and one, Gwennie, lived her whole life with her twin brother Lloyd as his housekeeper—but for Kathleen the miracle was not so much God as babies. Though Douglas was now her guardian Kathleen had, in effect, no one to look after her. She was reunited with Podge at a second boarding school, St Michael's, at Bognor, when Podge was called to look at her little sister's vests. There were nine, and they were all in rags. 'Absolute rags,' wrote Podge, 'in fact no underclothes fit to be seen, and Mrs. Sparks had spread them all on the bed for inspection.' This doesn't seem to have made Kathleen sorry for herself—no one to look after her also meant no one to tell her what to do. Podge wrote to Presh about 'naughty little Kathleen'. She was 'always in hot water' at school, so Podge said, but she knew (because she'd been told, after Smith's Classical Dictionary and a book on Christian Science were found under her mattress) that she wouldn't be expelled, because she was an orphan. Her siblings were largely grown-up, and she was beginning to think that so was she. Douglas would send her patronizing letters about how he had arranged for an aunt to be so good as to take her for the holidays—this was how she saw it, at least. At sixteen she wrote back saying, in effect, no thank you, I shall go and stay with my friends, who want me. One such was Milly, who had been on holiday to Italy, where a musician had kissed her. She wasn't certain that she might not be going to have a baby; Kathleen rather hoped she would, but thought it unlikely. But perhaps Kathleen had once again misjudged her relatives. One, a vicar's wife from Buxted, Surrey, wrote rather sweetly to Presh in March 1895: 'I hear from Kathleen this morning that prearrangements will prevent her coming to us for her Easter holidays. When she could not come at Christmas we looked upon it as a pleasure postponed . . . so perhaps she may be able to come to us for a bit in the summer.' But Kathleen had more exciting invitations than a vicar's wife in Sussex. She was going to London to stay with wicked Cousin Willie. She'd been to London before, in passing; she and Podge had had to cross it on their own on their way to Bognor. Podge had cried out, 'We shall never get across London alone! '; to which Kathleen had replied, 'Shan't you? I shall.' Unlike their Skene ancestors, most of the Bruces did not care for travelling. Podge thought Kathleen tremendously brave and cavalier in her attitude to the city, and this view was confirmed throughout their lives. "and that we should dine together in a restaurant, and that he should take me to a play. Seventeen, but a pantomime was all I had ever seen, and never at all in all my life had I ever had a meal in a restaurant, not even at a station. First problem—what should I wear? Next—would I know how to behave as though it were not the first time? There were the agonies of cutting down the neck of my prettiest day blouse; and agonies again, lest it be too low. And the dark serge skirt, how clumsy it looked! Well, I must tie a ribbon in my jolly hair and hope no one would look below my nice clean face. Oh, heavens, one must wear a cloak! What could I do? Lucky if the odd two pounds were left over for clothes. A cloak, an evening cloak? Quick, quick! I had an idea. One yard of a coarse, unbleached stuff called workhouse sheeting, costing a few pennies a yard, a square of blue dye, and bottle of gold ink. Secretly I went about the business, dyed the stuff, cut it in a cunning circle, and then made a bold, mad design in gold over it. The result would doubtless not be durable, but it looked not unlike a Fortuny cloak, and it would serve. " The next morning Kathleen saw Hener out of the window, swinging a live cat by the tail, hitting its head against the wall, and was less delighted. She poured water from her jug over him and threw up in her basin. Felix Skene did try to discipline his wayward sons. 'I have had the hell of a row with my guvnor,' Willie wrote to Presh. 'He told me to leave the bally hovel and I said I wouldn't and threatened to get him expelled from the Athenaeum.' Willie was always short of money to lose on the horses: at one point he considered blackmailing Aunt Zoe, the Archbishop's wife, by betrothing himself to a chorus girl. It was Willie who sowed the seed of art as a living in Kathleen's brain. She wanted to make up to him for being so taken with his brother when after all it had been Willie who had taken her out, so the next day, after the cat incident, she showed him some 'very feeble but pretty' watercolours that she had done, as a gesture of friendliness. At this stage she was meant to be going to be a teacher, like Irene and Presh—it was respectable, and would keep her out of trouble. 'Why on earth go in for teaching?' said Willie. 'Why not go in for art?' He probably forgot all about the suggestion. In 1900, after his wicked life had resulted in him 'absquatulating' to Bombay (where he worked for a bank, lived with an Indian boy in a tent, shot vultures, shocked the memsahibs and wrote scandalous letters to Presh asking her to send him 'naughty French papers'), he wondered whether 'pretty little Kathleen' had become a duchess yet. But in 1895 he told his seventeen-year-old cousin to hell with mathematics and Latin, she was lovely and should have a lovely life. Nonsense, she replied, but she didn't think it was nonsense at all. If you’ve ever wanted the experience of being in Renaissance painting then head out to any village in Le Marche during the 35-40 degree days of mid August. This is Ferragosto time – the holiday derived from Feriae Augusti – festival of the Emperor Augustus - which takes place to celebrate the end of harvest. Some celebrations are virtually unchanged in form, participation and music. The palio of Sienna is well known but lesser palio’s in smaller hilltop villages where pecorino sheep still browse the olive groves on the outskirts of the town walls, are perhaps even more steeped in their traditions. The word palio comes from the palium or piece of precious fabric that was given to the winners of horse races in ancient Rome. And most celebrations of Ferragosto involve a horse race or jousting race between different quadrants of the town or village. The hilltop town of San Ginesio on Wednesday 15th of August this year, was no exception. And while I can’t explain the intricacies of the parade I watched through shimmering heat against the backdrop of an unchanged medieval town square … it was incredibly regal. No one speaks or shouts as they walk the route to the jousting grounds where the cavalieri will compete for the palio… each group named after one of the four ancient portals to the town and dressed in the colours of their rioni. I’ve always thought people in Renaissance paintings have a certain look that a modern face lacks. But in San Ginesio I saw figures and profiles and expressions one might expect in artwork from the School of Rimini under the influence of Giotto. How did this page boy get that look? Or these young men shouldering their crossbows display such bravery yet at the same time such vulnerability? How were the women with their long necks and calm profiles able to show such regal dignity and yet such exquisite womanliness? These weren’t modern people. They had walked straight out of a Marchigianan painting and the 13th century stone walls and arches and far vistas of hills and sheep were merely painted backdrop. photographs copyright Dianne Hofmeyr. Please do not reproduce without permission. Sometimes the best events at book festivals aren't the ones that draw huge queues. One of the delights is stumbling across the unexpected: a book or an author of whom you have never heard, telling you things you didn't know, or kindling an interest in something you previously thought of as dull. 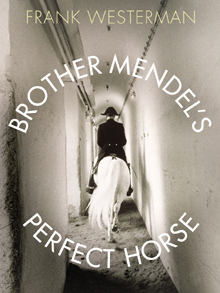 I hit the jackpot on this week at the Edinburgh International Book Festival, when, on a whim, I went to hear the Dutch Author, Frank Westerman, talking about his book Brother Mendel's Perfect Horse. I was completely unprepared for the revelations that followed, and the new light they shone for me on a huge range of historical events. As a good Festival-goer, I bought the book. It made me dump the blog I had started for this month, to share with you just a few of its highlights. My apologies if you knew all this already. Most of it (and much more I have no room for here) was news to me. Westerman’s book is about the famous Lipizzaner horses – the beautiful grey stallions of the Spanish Riding School in Vienna. There was a time in the 1960s when their stylised dancing to music was shown quite often on British telly, and I have to admit that I had always thought of them as rather naff – even slightly comic -- coming in a close second behind the Greek soldiers who kick up their legs as they march along in silly bloomers. Well, I’ve changed my mind, and not just because I now know more about the rigorous training they and their riders undergo. It’s because of the insight their story offers into our past and present. 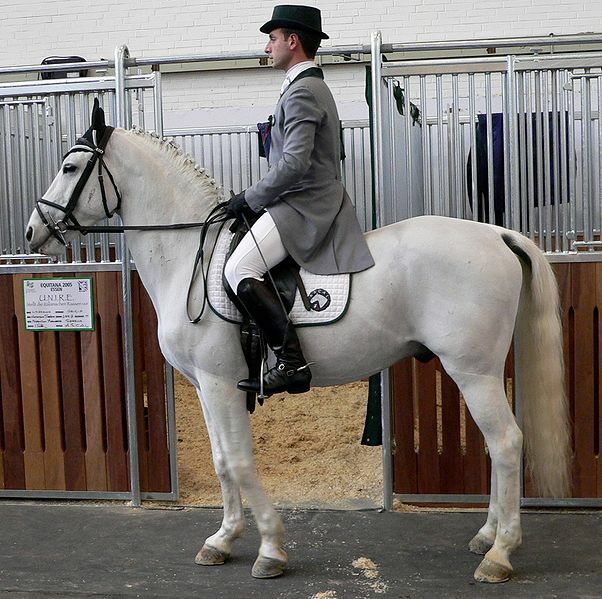 When Westerman was a child, he was told ‘touch a Lipizzaner, and you are touching history’. And what a history! Originally the ‘living crown jewels’ of the Hapsburg Empire, the fate of these beasts, and their enforced peregrinations across Europe and beyond in times of war, reflects not just political changes over four centuries, but the intellectual ferment centring on the concept of pure bloodlines and genetics which shaped the horrors of the twentieth century. From the late sixteenth century to the present day the horses have been status symbols for kings and tyrants. As human societies crumbled around them, heroic efforts were made to preserve the breeding stock – not just by Austrians, but by invaders from Napoleon to the American General George Patton who, in 1945, oversaw ‘Operation Cowboy’ which (bending the rules so recently established at Yalta) diverted military resources into ensuring that the Lipizzaners were a prize for the West. Nevertheless, some ended up on the other side of the Iron Curtain. Because the first of the line came from Lipica, in what became Yugoslavia, Marshall Tito was given the makings of a Lipizzaner stud farm (the offspring of which were starved, or massacred and buried in mass burial pits in war of the 1990s). 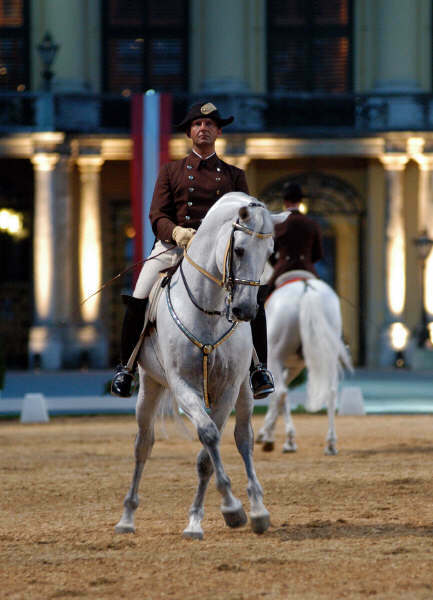 Tito used the horses as prestigious gifts, to leaders including Ceausescu of Romania, Nehru and Nasser. Emperor Haile Selassie of Ethiopia bought thirty – who came to a sticky end. In Western Europe, the Pope, our Queen, and Hollywood stars like Gary Cooper and Walt Disney all celebrated the Lipizzaners, despite their staus as emblems of the Nazi mindset. General Patton took some back to the USA. Their descendants performed at the inauguration of President Regan in 1980. Everybody wanted them – not just for what they looked like, or what they could do, but as representations of perfection, and for the majesty they projected onto their owners. 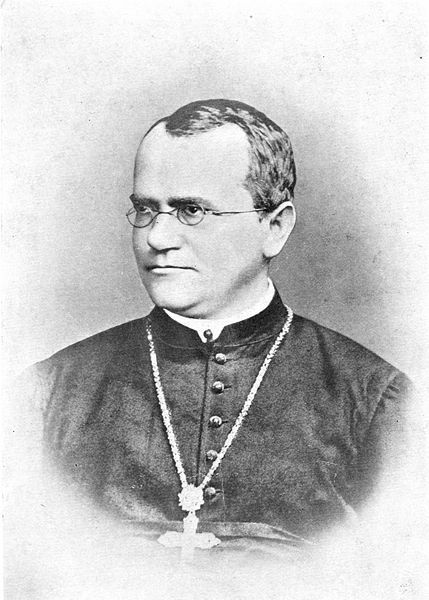 That, Westerman argues, had a lot to do with their place in the evolution of ideas about genetics – the science inaugurated by the nineteenth-century monk Gregor Mendel (hence the book’s title). by the mid 20th century his theories were being taken to their logical extreme. We all know about the Nazi ‘Angel of Death’ Josef Mengele, and his experiments in the concentration camps. You may not know, as I did not, that Auschwitz also housed a Lipizzaner stud farm – though the fact may not surprise you. Obsessed with the horses’ pure breeding , which condemned ‘substandard’ specimens to work or the butcher, Hitler was bound to be a fan. One of the most chilling moments in Frank Westerman’s talk was when he produced a biology text book for children issued to German schools in the late 1930s. Along with the main tenets of Mendelian theory of heredity, it included a fold-out form, on which pupils were required to enter full details of their families, working backwards through their parents, grandparents, and so on, listing not just names but physical characteristics such as colour of eyes and hair, etc. Then Westerman unfolded another, almost identical document. It was the pedigree of one of the Lipizzaner horses. 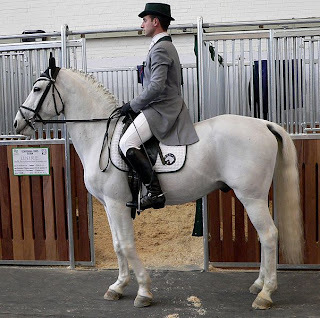 Not everyone took the same political message from Mendel’s theories, but the ideology and practicalities which lay behind the establishment and maintenance of the Lipizzaner breed could govern very different policies. 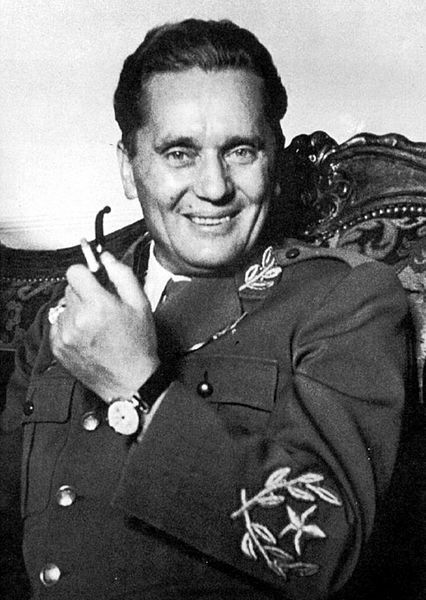 Tito, for example, saw in Mendelianism the potential for making bloodlines less pure, in the cause of uniting the disparate set of territories he was handed under the post war settlement. Tito insisted that the troops of the new country of Yugoslavia should be stationed in different provinces from those in which they had been recruited (Croats in Kosovo, Serbs in Slovenia, etc). This was in the expectation that they would mate with local women, producing a mixed, and therefore more stable, ‘Yugoslav’ population. As we know, it didn’t turn out like that. The biggest revelation for me was the Soviet response to the Nazis’ genetic engineering. Before and during the war, the Soviet Union was home to a state-sponsored centre of excellence in Menedelian studies and application. In 1948, Stalin obliterated all scientific institutes that followed Mendel’s theories. Through the biologist Tromfin Lysenko, Stalin imposed a scientific regime under which it was a crime to maintain that inherent characteristics are passed on from one generation to the next by physical means which could be analysed and manipulated. The notion was replaced by a gene-less one which acknowledged that a species could share features of its predecessors, but that these were imparted entirely as a result of (influencible) experience. This force of evolution could be harnessed by ‘drilling’ plants, animals and humans. Until the time of Brezhnev, Nature was entirely rejected in favour of Nurture. For the soviets, acquired characteristics could be inherited. So pigs were to be made hardier by being subjected to freezing weather. Crops would be stronger if many seedlings were planted in the same hole and had to compete for light and nutrients. What one generation of animals or vegetables ‘learned’ they would pass on. ‘Mendelian’ cross-breeding was forbidden, with the result that Soviet agriculture failed to support the Russian people. And the idea of long-term reprogramming was applied to humans, too, in the labour camps. 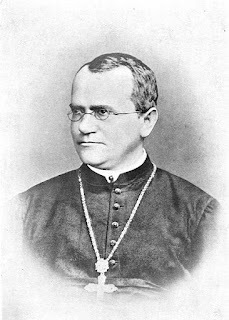 Under Lysenko's influence, all commemoration of Mendel was expunged from his home town of Brno (in what is now the Czech Republic) and any Lipizzaner horses which had ended up on Soviet territory after the upheavals of World War II were destined for the cooking pot. Stalin died just before the double-helix was revealed to the world. In the era of the genome, his attitude might seem laughable (were its consequences not so tragic). Mendel has been rehabilitated with a new museum in Bruno. But Westerman postulates that, because of our forefathers’ history and our own scientific outlook, we are in danger of slipping into a mindset where we feel compelled to take one side or the other in the Nature/Nurture debate (at a time when the latest experimental science suggests that the two are probably interlinked). There is, for example, no mention of the Lysenko years in the reconstituted Mendel museum in Brno. Are we tempted to believe that, in the age of cloning, the argument is over, and DNA determinism has won? Once again, the horses of the Spanish riding school (now subject to artificial insemination) and their American cousins (one of whom has been cloned) are in symbolic of society's attitude to breeding. In this climate, Westerman warns, genetic tyrants of all political persuasions may find space to grow. And we can guess which horses they would like to ride. 'The ‘eighth day of Creation’ dawned some time ago. The human species has not only deduced the workings of evolution, but has succeeded in taking apart its motor, boring out the cylinders and reassemblng the whole contraption. On this souped-up moped we then hurtle forwards at breakneck speed -- cockily and without a helmet. By the way, at the Edinburgh Book Festival today at 5pm, I will be interviewing History Girl contributor Sally Nicholls about her novel set at the time of the Black Death: All Fall Down. Until Monday, you can still see the dramatisation of my book, Montmorency, at C Venue in Chambers Street. 7.25 every night. And, passing though Brimingham after I heard Frank Westerman speak, I saw a huge poster announcing that the Spanish Riding School of Vienna is coming to the National Exhibition Centre in November, to perform alongside our Olympic dressage stars.